HUÍZAR, PEDRO (1740–1804). Pedro Huízar, surveyor, administrator, master craftsman, sculptor, farmer, and judge, was born at Aguascalientes, Mexico, in 1740. He married María de la Trinidad Henriques in 1775. The first book of Mission San José documented the marriage, but was destroyed during the Guitierrez-Magee Revolt in 1813. The couple had seven children, two daughters and five sons; his second eldest son, José Antonio Huízar, became alcalde at Mission Concepción after the death of his father in 1804. Shortly after his first wife died, Huízar married María Gertrudis Martínez, the widow of Juan Antonio Flores, on February 5, 1798. In 1790 he was commissioned by Governor Manuel Muñoz to draw up plans for the reconstruction of San Antonio de Béxar Presidio and to propose improvements for its defenses. The drawings were submitted along with estimates, but the plans were never executed. On March 4, 1791, he was sent to La Bahía to report on the feasibility of irrigation for lands around Nuestra Señora de Loreto Presidio, but he concluded that the cost would be prohibitive. San José Mission. Image available on the Internet and included in accordance with Title 17 U.S.C. Section 107. Huízar was appointed to the position of surveyor and measured the lands of San Antonio de Valero Mission in January 1793 under the direction of Governor Manuel Muñoz. He was present when the governor distributed the lands to twenty-three adult Indians, and for his services he also received a small parcel of that land. Huízar also surveyed the lands of missions San Francisco de Espada, San Juan Capistrano, San José y San Miguel de Aguayo, and Nuestra Señora de la Purísima Concepción de Acuña when they were partially secularized in July 1794. He received land for these surveys at San José and Concepción. In 1794 he was appointed justicia of Mission Concepción by Governor Muñoz, and in 1796 he was appointed justicia at Mission San José, where he was appointed to oversee the temporal affairs of the Indians. San José Mission Rose Window. Image available on the Internet and included in accordance with Title 17 U.S.C. Section 107. Over two centuries Huizar gained notoriety within oral tradition as the sculpture of the façade and Rose Window of San José Church. 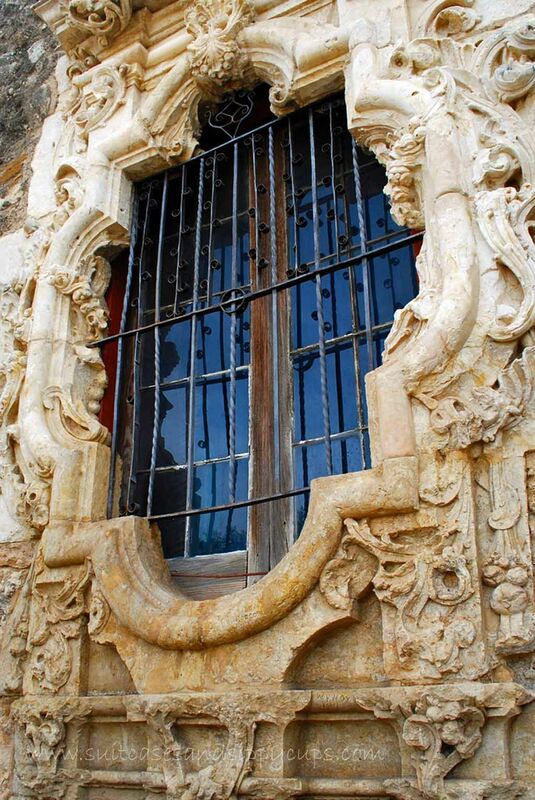 The window was added sometime after 1777 and the mission records identified Huizar as “El Maestro” or master craftsman for his specialized trade. It is likely that Huizar received the title from Father Pedro Ramirez de Arellano who served as administrator of Mission San José and president of all missions in the province. Local legend contends that Huizar trained as a sculpture as a youth in Spain and traveled to the New World to seek his fortune. He is documented as living in the San José community with his wife Maria and two children Josefina and Joseph. Huizar reportedly named the window at church after his lost love Rosa, but Spanish archival documents do not corroborate all aspects of the legend. Pedro Huízar Garden Historic Marker. Image available on the Internet and included in accordance with Title 17 U.S.C. Section 107. 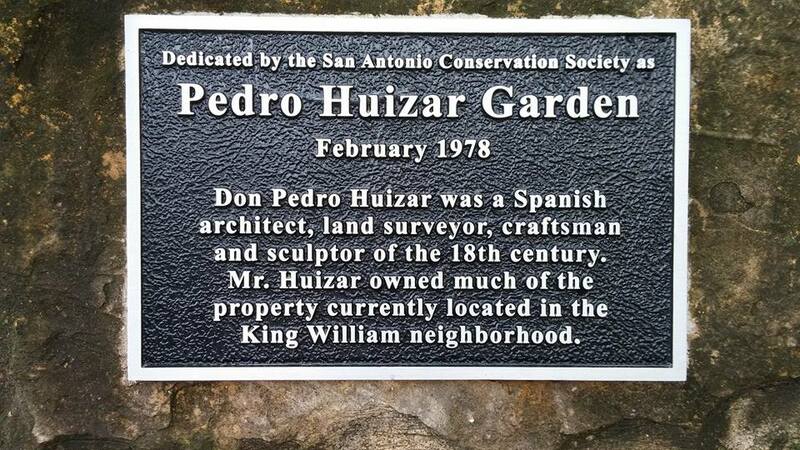 In 1978 the San Antonio Conservation Society donated a portion of Huízar’s land to the city for use as a park named in his honor. On January 13, 2012, city officials and Huízar’s descendants celebrated the dedication of Pedro Huízar Garden and unveiled a bronze plaque. Carlos E. Casteñeda, Paul J. Folk, and Texas Knights of Columbus Historical Commission, Our Catholic Heritage, 1519-1936 (Austin: Von Boeckmann-Jones Company, 1950). Jesús F. de la Teja, San Antonio de Béxar: A Community on New Spain’s Northern Frontier (Albuquerque: University of New Mexico Press, 1995). Marion A. Habig, San Antonio's Mission San Jos‚ (San Antonio: Naylor, 1968). Katherine Ann McDowell, “Characterization and Conditions Assessment of the Sacristy Window Mission San José y San Miguel de Aguayo San Antonio, Texas” (M.A. thesis, University of Pennsylvania, 1997). Pedro Huizar Documents, 1772-1805, San Antonio Spanish Archives, San Antonio. Residents of Texas, 1782-1806, University of Texas at Austin at San Antonio, Institute of Texan Cultures. Mission San Jose document #343, Catholic Archives of San Antonio. Handbook of Texas Online, Rebecca H. Green, rev. by Rudy H. Gonzales, "HUIZAR, PEDRO," accessed April 20, 2019, http://www.tshaonline.org/handbook/online/articles/fhu22. Uploaded on June 15, 2010. Modified on June 14, 2018. Published by the Texas State Historical Association.